Take out your guidebooks and look up Guam. You’ll likely not find it. There isn’t a Lonely Planet Guam, nor is there a Foddor’s, Frommer’s, Eyewtiness Travel or Rick Steves’ account of the island. You likely will have a tough time locating anything Guam-specific in any 1,001 Places to See Before You Die, 500 Islands to Visit, or any publications of that ilk either. Outside of a few independently published (and more often than not, outdated) books or a short chapter squeezed into , the best trip-planning for Guam is to reference a handful of online blogs and have a rough-it-when-you-get-there mentality. 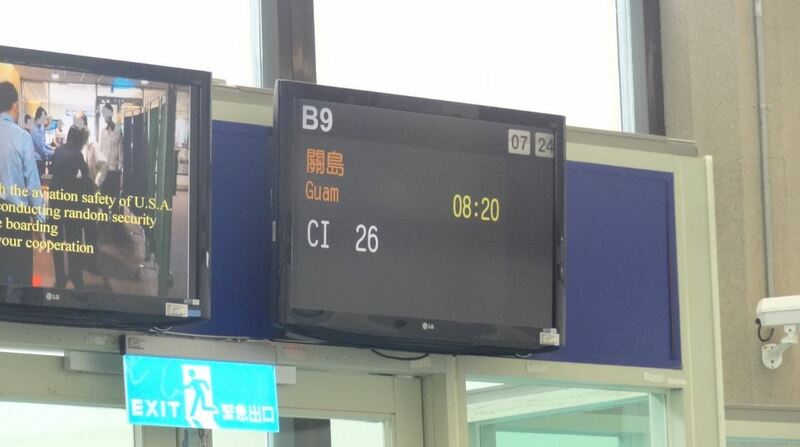 Dream fulfilled: I’m at the boarding gate for Guam! Breeah and I decided on Guam back in late January. Alaska, the last state we’ve yet to visit, would have to wait as we decided to add two far-flung U.S. territories to our American travel log (we also visited the Northern Mariana Islands on this trip, a day-long journey I’ll blog about later in the week!). Our journey to Guam was indirect, to put it mildly. Instead of going with a very pricey United Airlines ticket (United has cornered the U.S. flying market as far as Micronesia is concerned), we drove all day from our home base in Eugene, Oregon up to Vancouver, B.C. with tickets on the Taiwanese carrier, China Airlines. Our first flight, an 11.5 hour jaunt to Taiwan, was the longest either of us have ever been on. From there, we were the only typical looking American flyers en route to Guam, the rest of the aircraft dominated by vacationers of Asian descent. 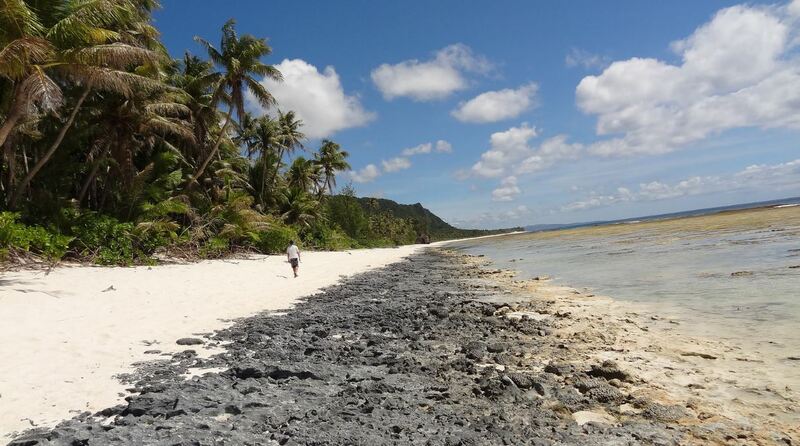 This is actually status quo for Guam, as Asian tourists flock to the island as a nearby American vacation destination. American tourists (with no military affiliation) are nearly impossible to pick out. Arriving in Guam is quite similar to arriving in any continental U.S. airport. We were the only two from our flight that used the U.S. citizen line at immigration, breezing through in about 15 seconds (no passport stamps). The airport signs and greetings have a low-key Hawaiian vibe. After a few minutes of figuring out where our rental car was (Pro-tip: Payless is located off-airport, get the help desk to call them), we were bound for our resort hotel on Tumon Bay. 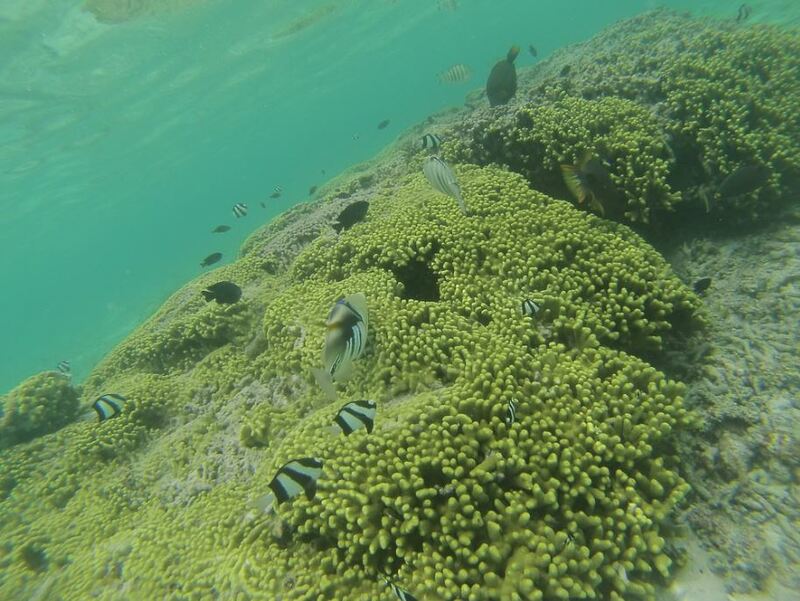 We snorkeled four times during our week on Guam, there is plenty of colorful reef life in the shallow waters near shore. Guam is a fascinating study in modern demographics. Here’s this tiny speck out in the Pacific ocean. I would guess a majority of stateside Americans probably don’t know of its existence, with far fewer actually understanding its political status as a U.S. territory. I wouldn’t want to guess how many have actually gone out of their way to visit. Yet, here on this island in Micronesia, Americana spilleth over. Fast food. Check (McDonalds, Jack-in-the-Box, Burger King, Little Caesars, Subway, to name a few). Shopping Malls. Check (Micronesia Mall might as well be located in your standard suburbia). Highways and traffic signage? All familiar to any U.S. driver. U.S. Postal Service – its here, and its the same price to send mail from here as it is anywhere in the U.S. 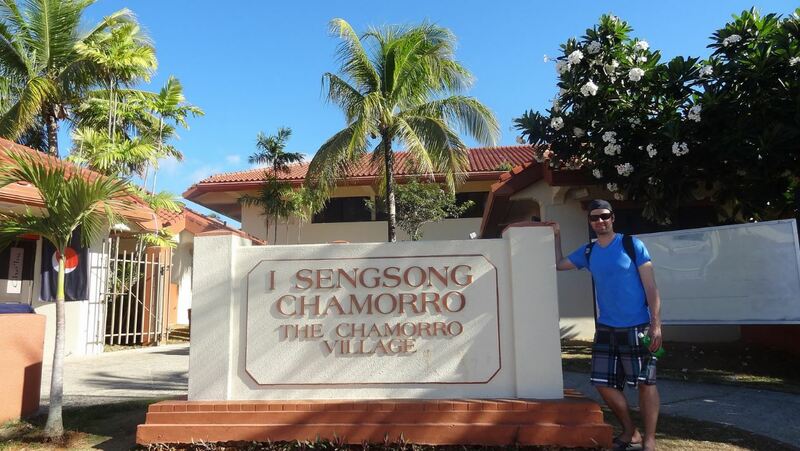 The local Chamorro people speak a near-perfect American English dialect. The license plates say “GUAM U.S.A.”. If Chuck E. Cheese exists here (it does), then this really must be the grand ‘ol United States. Guam has a long history of different “landloards”, here is the view from Fort Nuestra Senora de la Soledad, an old Spanish establishment in the south of Guam. It is always a bit more complicated than that. While the history between Guam and its landlord has been generally beneficial for both sides, there were signs while I was there that at least some local Guamanians are not pleased with former indigenous land still being taken over by military, a presence that is quite large on an already very small island. 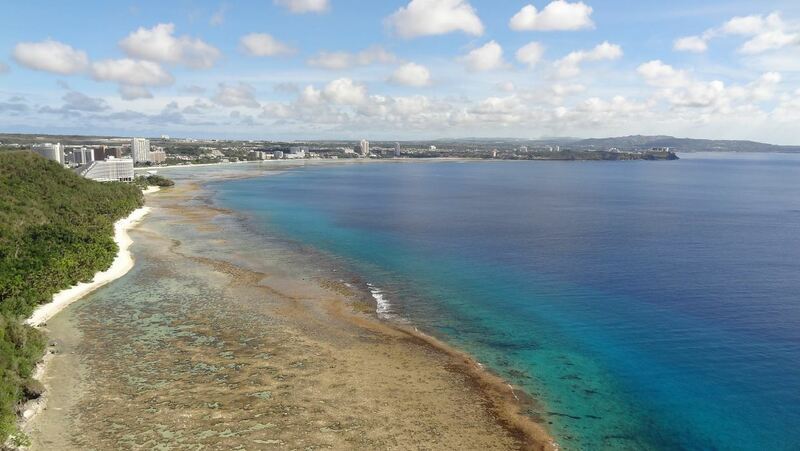 While most people on Guam seem to enjoy the current relationship with the U.S., I’m sure there is a segment of those who would rather Guam pursue full autonomy and independence. 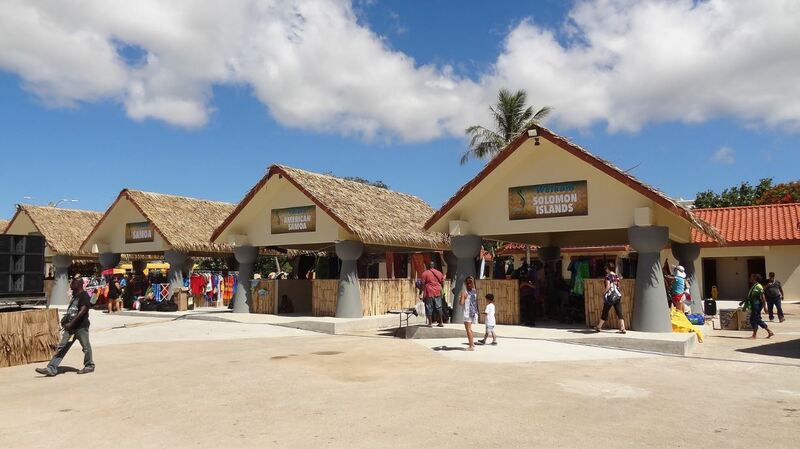 The Festival of Pacific Nations gave us a sample of the taste, cultures and people of nearly 30 Pacific island nations. From the moment you step foot in touristy Tumon, with its various high-end shops (I’ve never felt the need to step into a Gucci store, um, ever, but its here if you’re into that kinda stuff), you can tell that Guam isn’t your typical American destination. As I touched on, Guam is definitely marketed for the Asian tourist. Many pamphlets, guides and brochures are in Japanese or Chinese first, English second or third (and, many times, Russian in there as well – we actually did spot a couple of Russian tourists). There are some attractions specifically marketed to non-westerners. Our hotel was owned by a Japanese company and while some of the local population worked there, we likely were one of just a handful of western visitors staying there. The whole dynamic plays games with your brain. I kept thinking how odd it is to be an American tourist, technically in America, but feeling so far removed from the U.S. at the same time. We were oftentimes mistaken as local military (as discounts are often offered at various stores and restaurants). 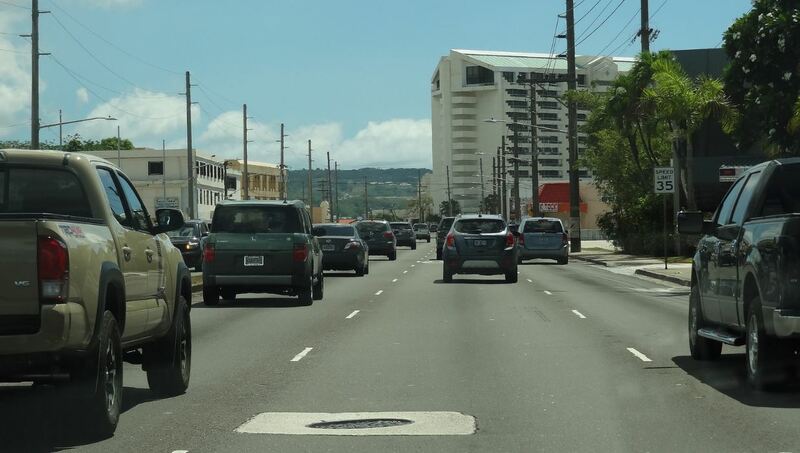 This whole effect generally only applies in Tumon, where vacationers delight in the resort life that dots the fine stretch of sand and beautifully clear water of Tumon Bay. It was actually quite fun to feel like foreign visitors on our soil, an experience I don’t think is easy to repeat elsewhere. The Chamorro Village (especially when coupled with FestPac) is rocking on Wednesday nights. Outside of the resorts, there is loads to do in Guam: There is a beautiful wildlife refuge in the north. There is World War II history galore (and a national park dedicated to it!). 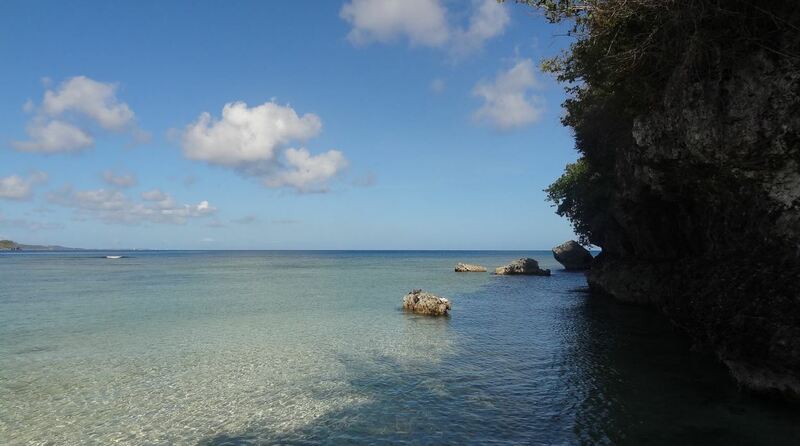 There are many beautiful beaches (and with that, many opportunities to dive, snorkel or even go caving). There are impressive hikes to be had here, whether along the coast or in the interior. There are places to eat everywhere, for every taste. We even had a bonus, the every-four-years Festival of the Pacific Arts was being held on Guam while we were here, giving us an opportunity to mingle with people and experience the cultures of nearly 30 different Pacific island nations (including some of my favorites like Easter Island, Norfolk Island, American Samoa and Yap). The view from Two Lovers Point, with Tumon Bay (and its hotels) in the background and Fai Fai Beach in the foreground. For Breeah and I, Guam ended up being way more than just a novelty destination. It isn’t just a tick-off of the ol’ American travelling checklist. It is a prime destination and one worthy of your time, consideration and effort to get out there. For the next couple weeks or so I’ll be focusing a lot of my blogging efforts on our trip out to Guam (and the nearby Northern Mariana Islands), so stay turned for much more!